Polyester bag with coloured inlaids and shoe-holder. Detachable internal pocket with name tag. Rubber studs. Rigid base not included. Slate is the Erreà backpack designed for the most demanding sports clubs and athletes. 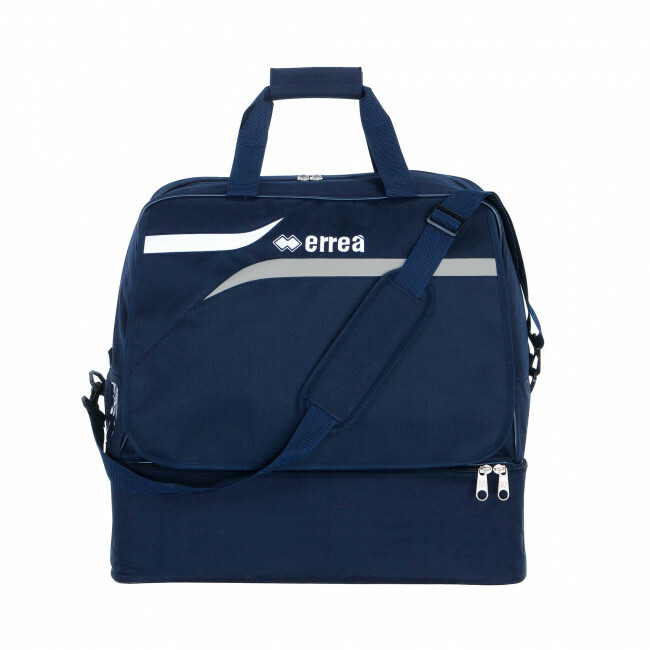 This holdall may be used for competitions or training sessions and, as well as being extremely sturdy and spacious, it also offers a practical separate bottom compartment that may be used to hold shoes (rigid base not included). In this model we gave special attention to the design and to the bag's looks: The front part may be opened by lifting it and then closed thanks to the practical Velcro closure that makes this bag similar to a shoulder bag. Our care for even the smallest details is shown in the small pocket on the side of the bag, in which athletes may insert a name tag to distinguish their bag from that of their team-mates.